Legend was that the cadets marched all the way from Denver to Colorado Springs. It never happened, but the imagined event is interesting to think about. 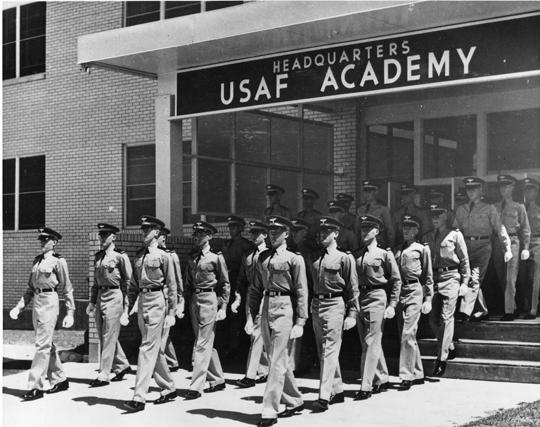 The Air Force Academy’s move from the temporary site at Lowry Air Force Base in Denver to the permanent site north of Colorado Springs in August 1958 was one of the most momentous events in Academy history. Now, 60 years later, the Association of Graduates celebrates the move to the permanent site. Despite that fact, there is some confusion about when the move actually happened. Various sources provide different information. Perhaps because the move took place over several days, some confusion is inevitable. So when did the march-in take place? In this piece, I will unpack the issue, describing the milestone as covered by several sources. By the end, I hope to provide a definitive answer to the question. First off, we can dispel the urban legend that the cadets marched all the way from Denver. While that would have been impressive indeed, it would have been a mammoth undertaking (see sidebar). 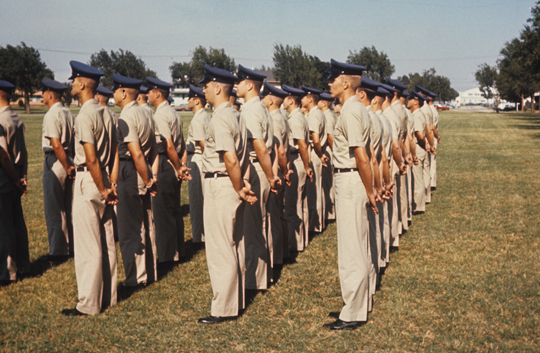 The members of the Class of 1962, having recently completed Basic Cadet Training, were bused to the North Gate. Led by upperclassmen and Air Training Officers, and with 400 cadets lining the route, they then marched the approximately four miles to the Cadet Area and up the battle ramp to the Terrazzo. That much we know. That there was uncertainty about the actual date came early in my research. My go-to source for historical information about the Academy is former Academy librarian Col. George Fagan’s definitive work, The Air Force Academy: An Illustrated History. I was disappointed to learn that, essentially, he punted. 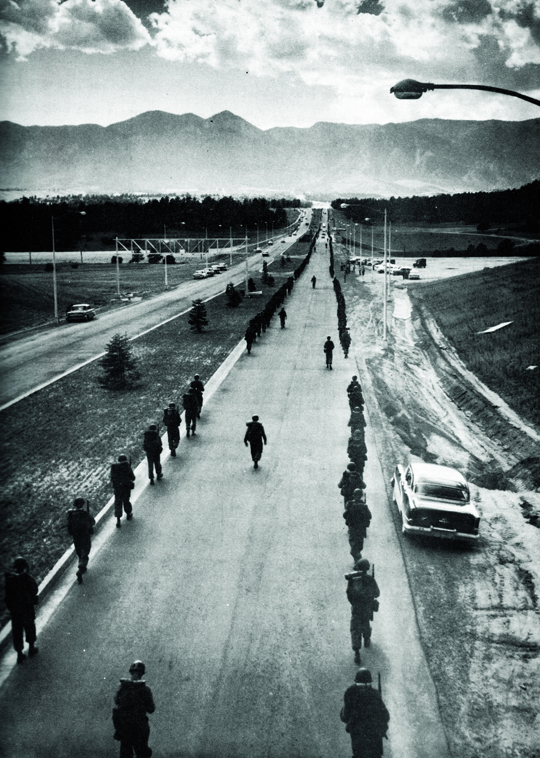 The cutline on the photo on page 120 says in part, “In late August, Basic Cadets climb the steep ramp leading to the Terrazzo Level of the Academic Complex. They had just completed a march from the North Gate." This lack of specificity is most unusual, as the book contains hundreds of exact dates. By this point, I was totally baffled, with four possible dates for the march. I hadn’t unpacked anything. Other newspapers, to include two from Colorado Springs (The Free Press and The Gazette Telegraph), also mentioned the process starting on 29 August, but didn’t mention the march-in. I can certainly see why Col. Fagan chose to use “late August” rather than a specific date, and why other historical reviewers and writers were confused. Having said that, however, I believe the “preponderance of the evidence” points to 31 August. Particularly compelling is the detail and specificity in Hosmer’s report. For one thing, it was a first person account. Not only that, but Hosmer’s description was published two months after the actual march, so the time-proximity to the event would indicate a more accurate recollection. Plus, it’s General Hosmer; c’mon! So, I believe we can now authoritatively state that the Class of 1962 and others marched from the North Gate to the Cadet Area on Sunday, 31 August 1958. First off, we can dispel the urban legend that the cadets marched all the way from Denver. While that would have been impressive indeed, and the cadets in those days could totally have done it, it would have been a complex, wearying, and time-consuming enterprise. Thought experiment: What if the cadets HAD marched all the way from Lowry Air Force Base? As a starting point for the hypothetical August 1958 march, I chose the Commandant of Cadets building at the now-closed Lowry Air Force Base. That building, which was added to the National Register of Historical Places on 4 September 2007 for its important role in Air Force Academy history, is located at 1016 Boston Street, Aurora, Colorado. Using Mapquest, which didn’t exist in 1958, I discovered it is 59.7 miles from there to the Cadet Area via I-25 -- which didn’t exist in 1958. Still, we can assume, though the route might be slightly different, the mileage would be similar. Also, in the days before I-25, its predecessor, Highway 85/87, was a two-lane road reminiscent of today’s Highway 83. Such a motorway would certainly not have been conducive to having hundreds of cadets cruising along at walking speed (in formation, of course), but for the moment let’s assume they could do so safely. With one-hundred two-foot steps per minute, I calculate the cadets would travel 200 feet per minute, which means they would march one mile every 26.4 minutes (or 2.27 miles per hour!). Extrapolating out, traveling 60 miles (318,600 feet) at that pace would take 1,584 minutes (26 hours, 24 minutes). So, if these superhuman cadets had marched straight through without any stops (again, easily doable for them), they could have made the trek in a little over a full day. It seems reasonable, however, to factor in a ten-minute stop every hour for rest, hydration, sustenance and the performance of required bodily functions. These breaks would add 5 hours and 27 minutes to the hike, raising the total time required to 31 hours and 52 minutes (and require a train of support vehicles with food, drink, possibly some medics, and a number of very portable porta-potties). Even with the rest breaks, though, covering that distance in one shot might not be practical. Overnight rest stops would probably be in order. Here, mercifully, we have real world experience to consider. Walking 60 miles is, in fact, not that unusual. Susan G. Komen and Avon are two organizations known for conducting walks of that distance to raise money for charity. Their events are set up to take three days. That is an average of 20 miles per day, which seems a much more feasible pace for our intrepid cadets to have marched. The overnight stops, of course, would bring a world of additional logistical challenges, primarily related to lodging. It would take a caravan to hold all the tents, sleeping bags, etc. I guess Superintendent Maj. Gen. James E. Briggs and the leaders of the day made the right call to have the cadets march to the Cadet Area from the North Gate and not all the way from Lowry Air Force Base. While the Air Force Academy cadets labored in Denver during the late 1950s, there was a flurry of building activity going on at the planned permanent site. By the spring of 1958, it had become clear that the new facility would be sufficiently completed for members of every class to spend at least some time at the Colorado Springs facility. Excitement for the transition, however, was not unanimous.